One of the things we hear most often from our clients is how much they love working with our experienced and versatile staff who go above and beyond to make sure that our clients are well informed and our trips are well organized. Trek takes pride in taking care of our clients, both our seasoned travelers and our first-timer trekkers. Being able to provide clients with first-hand experience from our team, who are routinely traveling abroad and checking in on our partners and popular destinations, means that you are going to get the best, and most detailed, the information we can provide to you before your departure. Beyond this, Trek loves being a one-stop-shop for our clients in our ability to provide a full-service travel agency. Our in-house air experts are extremely knowledgeable about airline routes and pricing and are dedicated to finding you the best flights that work for you to get you from your hometown to your destination and back again. Beyond the initial planning and airline assistance, we provide for our clients is our ability to ensure you have all the necessary information regarding travel visas, passports, hunting and fishing permits, gun entry permits and any other licensing procedures that your trip may require. Our team helps organize as much of this documentation as possible for you, and what we can not facilitate ourselves we provide detailed instructions so you can complete the documentation accurately to avoid any government red tape. Having this level of support behind your trip means that everything is in place to provide you with a worry-free experience from start to finish. However, as many of you will agree, travel is rarely without its bumps in the road but using an agency as experienced and dedicated as Trek means that you have support 24/7 with a team that is able to improvise when necessary to ensure we find the best possible solution to any issues that may arise. When searching for an agent or outfitter for your foreign travels, we think it is vitally important to choose one with a reputation for practicing conservation, and understands its responsibility to the future of hunting and fishing destinations. Trek Safaris has always been a leader in conservation issues, dating back to our conception in 1973. Realizing that fisheries around the world are indeed assets, Trek has practiced “catch and release” programs in all the destinations we promote. This has substantially enhanced the fish populations and has increased chances for hook-ups for our guests. Our conservation efforts have gone a long way towards establishing solid relations with the local natives (especially in third world countries), and encouraging good will for the future. While you are browsing through our website, you will not see dead billfish hanging on a scale or piles of fish rotting in the sun, but only live fish that have been either released or taken as legal limits such as salmon, halibut or an occasional dorado. It is no secret that Trek is the largest wing shooting agency in the U.S., sending thousands of shooters around the world every year. This fact is supported by our 40 years of experience in the hunting arena, whereby our staff has actually operated these hunts to our specifications and then passed along our knowledge to the local outfitter. In our view, the single most important aspect of providing a good hunt is to scout, scout and scout some more and then hunt in a responsible manner. It does no good to find the birds if you do not implement a strategy that will allow consistent hunting across the board. In some countries where limits are either non-existent or enforced by the local authorities, it has always been our position to impose voluntary limits for which each hunter is responsible. In most cases this has worked to everyone’s benefit as our clients get to hunt areas that receive little pressure, and we are able to conserve the hunting areas for the long haul. 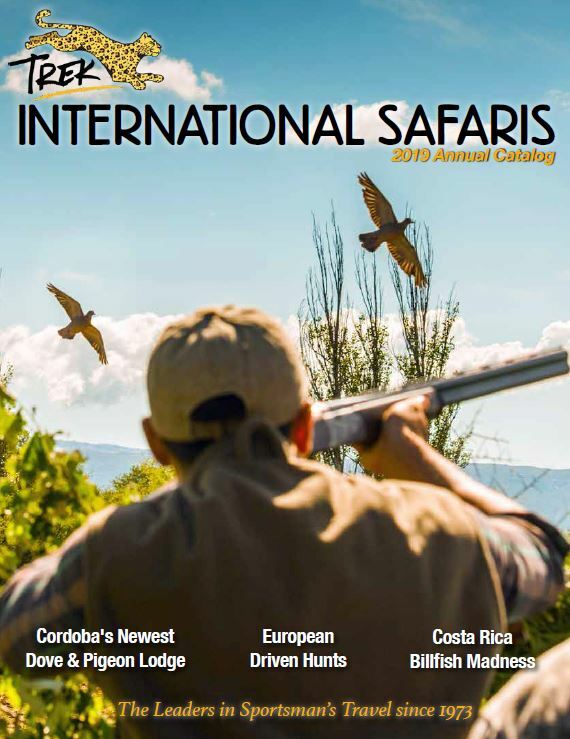 It is Trek’s position that there is nothing to gain by hunting any species to near extinction and our long-term managing of the game is the main reason we are rated the top wing shooting agency in the U.S. by most major publications. For information Travel Protection Plans for travelers of Trek International Safaris, click HERE. Are there any diseases I should be aware of? In some cases, preventive vaccinations or medicines are required. Please check with your personal physician or the Center For Disease Control (800-311-3435 or www.cdc.gov) regarding inoculation information for the area you are visiting. Passports are required for all U.S. citizens. Some countries also require that your passport be valid for six months after travel. Please contact the Trek Safaris office if you are not a U.S. citizen or have any questions regarding your passport. Some countries do require a visa. In most instances, Trek Safaris can handle the paperwork for you, or put you in contact with an expediter who specializes in visas. Do I need a hunting/ fishing license? Hunting or fishing licenses are required for all Trek Safaris trips. The cost of this license is included in your trip fee. License forms required for your destination will be sent out at time of billing. Yes, most of our lodges offer gun rentals. Please call the Trek Safaris office for rates and types of guns available. What type of fishing equipment is available? Trek has many years of experience setting up trips in foreign countries. This experience includes knowing what equipment works best. Trek Safaris provides the best equipment available for each given area. Please contact the Trek office for any questions on the type of equipment available for your destination. Every client will receive a trip itinerary approximately 60 days prior to your trip. Your itinerary will list recommended clothing and equipment lists for your destination. Can non-hunting or non-fishing customers go on one of your trips? Most certainly, however, some destinations offer more activities than others. Please call the Trek office to see what additional activities would be available for your non-hunting/non-fishing companions. Our outfitters are adept at serving international cuisine, as well as local favorites. Each location has different specialties and offers the best food available for the area. Many countries still do not have water that is safe for drinking. Bottled water is available on all of our trips and the Trek office can advise you on your destination. When is the best time of the year to go on my trip? All of our advertised dates are offered during the season for each area. Water levels and tides will affect fishing, and the Trek office is knowledgeable in helping your pick your date. Weather can affect both fishing and hunting trips and is beyond our control. In many instances, extending your trip or adding a side trip is no problem. Please call the Trek office for suggestions or questions on a particular destination. Do your outfitters and guides speak English? All of our outfitters are bilingual. Captains, lodge or camp managers, and guides are all experienced in the local areas but may or may-not be bilingual, depending on the location. For the most part, we prefer local guides who know the area. Feedback and performance help us in the selection of the best guides. What advantages are offered by booking my trip with Trek?